The United Food and Commercial Workers (UFCW) union has been trying to unionize Wal-Mart stores for over 15 years and had little success despite multiple incarnations of anti-corporate campaigns. The most recent in this series is a two-fer: Making Change at Walmart (an open UFCW project) and the Organization United for Respect at Walmart (OUR Walmart), a worker center supported by UFCW. 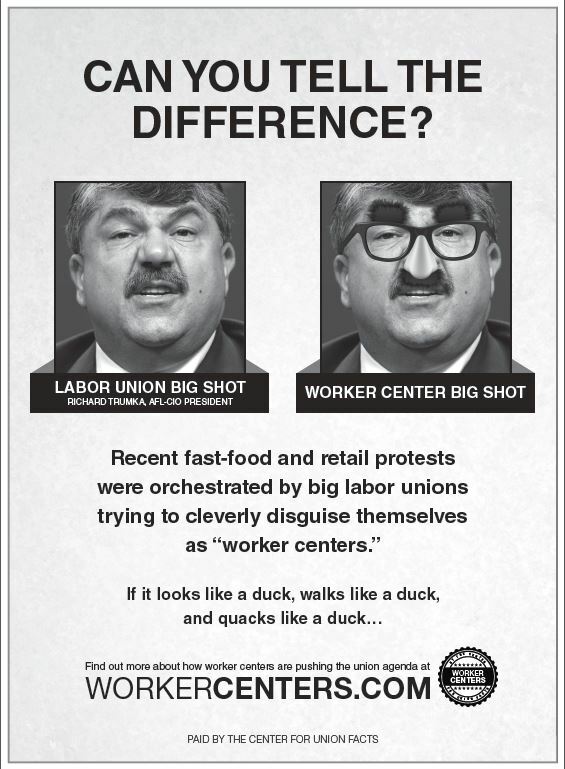 The worker center OUR Walmart takes pains to emphasize in public statements that it isn’t the UFCW in new colors (green and black instead of the union’s usual blue and gold). OUR Walmart’s website describes the organization as “an independent, not-for-profit organization for hourly Associates.” An OUR Walmart member told the Wall Street Journal that “OUR Walmart is an independent organization of Walmart associates.” And a UFCW communications staffer told media in Washington state that OUR Walmart “is an independent organization created to change Walmart.” You get this picture. Any organization of any kind, or any agency or employee representation committee or plan, in which employees participate and which exists for the purpose, in whole or in part, of dealing with employers concerning grievances, labor disputes, wages, rates of pay, hours of employment, or conditions of work. If a worker center has the intent to “deal with” employers, then it’s a union, and it’s subject to labor unions’ regulations limiting organizational picketing, among other tactics. If it isn’t, then it isn’t, and the thirty-day limit on picketing before submitting a representation petition does not apply. The UFCW and OUR Walmart (through UFCW, naturally) made a statement to the National Labor Relations Board disavowing intent to organize Wal-Mart workers. However, their attorneys said something different to the California Superior Court for Los Angeles County. Labor unions have certain rights under the National Labor Relations Act and California state law to access an employer’s property that general public agitators do not have. So, what is it? Is OUR Walmart seeking (or does it intend to seek) to “deal with” Wal-Mart under NLRA or not? 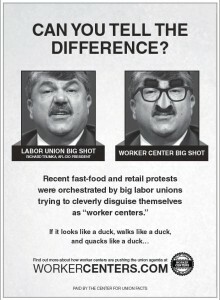 If you’re an OUR Walmart/UFCW attorney, it seems to be whichever you believe is most useful.